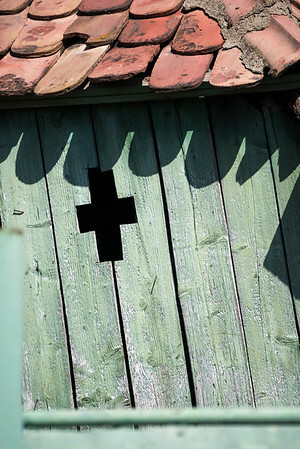 Photographs taken in Romania from Cluj, Maramures, Bucovina, Transylvania and Bucharest. 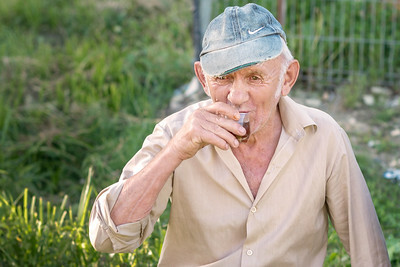 An elderly gentleman in Vama, Bucovina, Romania enjoying a beverage at the end of the day. Is it palinka? Who can tell. 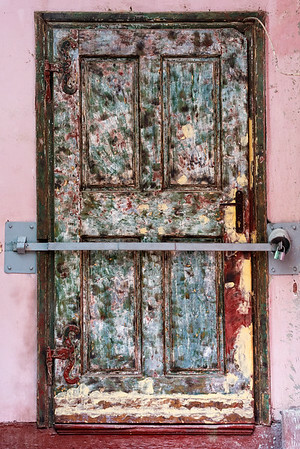 A very eccentric door in Romania. 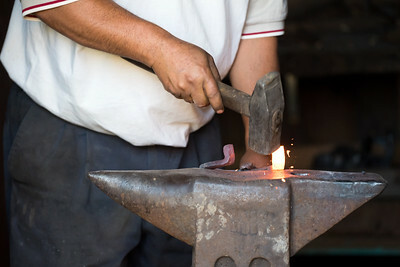 A Romanian man forging a horse shoe in a hot an unforgiving environment. 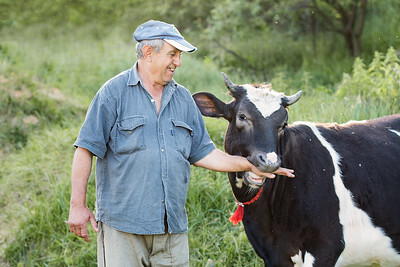 A friendly Romanian and his cow that enjoyed chewing on his arm. 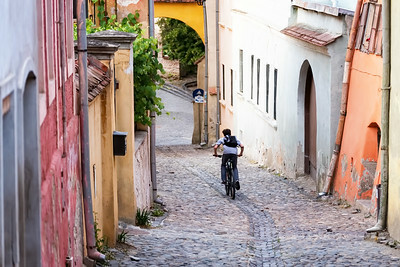 While in Vama we went for an evening walk to enjoy the beautiful golden hour light. We happened upon three gentlemen having an evening drink who were happy to let us photograph them. Eventually the whole family and a horse joined in on the fun. But this guy was super proud of the fact that this cow would chew on his arm. The people in this country are so awesome. 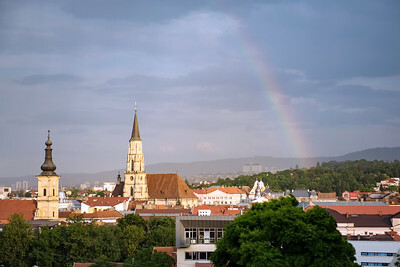 Rainbow over Cluj. While hiking up a crazy amount of stairs to get to a restaurant for dinner, I turned around while taking a break and saw this rainbow forming. This was right before an epic rainstorm came crashing in and luckily I made it to the restaurant right as the rain started to come down more heavily. 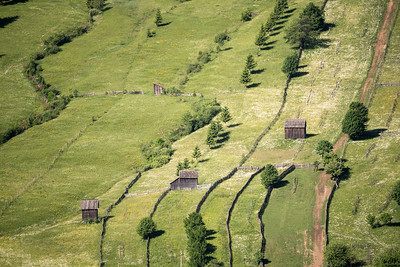 Cabins lining a Romanian Hillside. 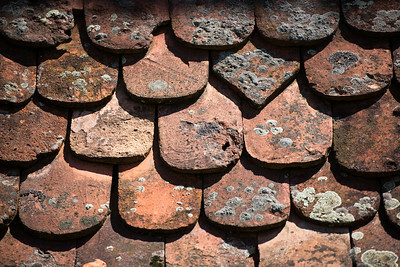 Shingles on a roof in Romania. They all look so unique, so weathered and so customized. 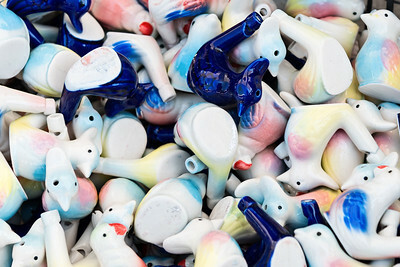 There are no two that look exactly alike, and there is one that is pointed rather than rounded. An odd shingle in the bunch. 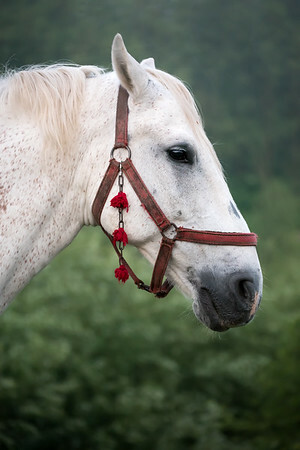 A white Romanian Horse with red tassels. 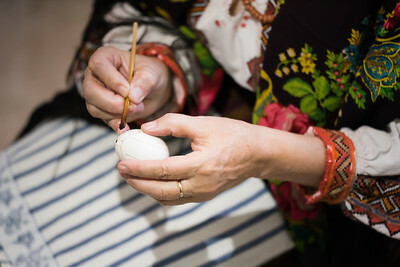 Traditional egg painting done by the egg lady in Romania. I would never have the steady hand and patience to do such intricate work on a delicate egg. 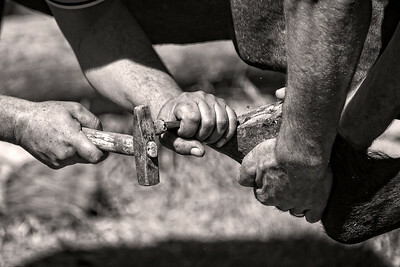 A blacksmith in a rural area in Romania working on preparing a horse hoof for a new set of horseshoes. 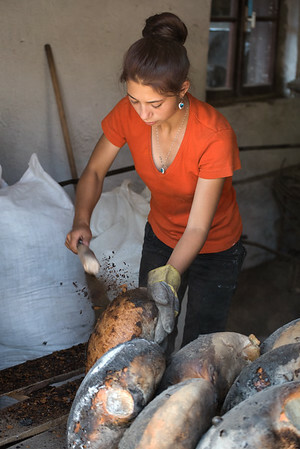 Traditional bread making in Romania. The bread is cooked until the outer crust is burnt, and then the burnt portion is removed by hitting the bread with sticks sending the burnt parts flying. 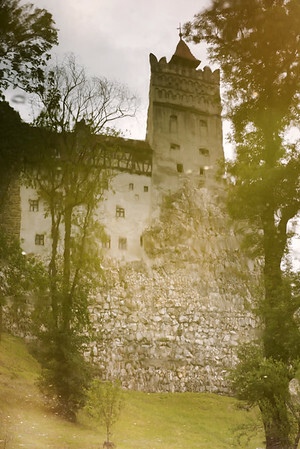 A reflection of Bran Castle captured in the pond out front. 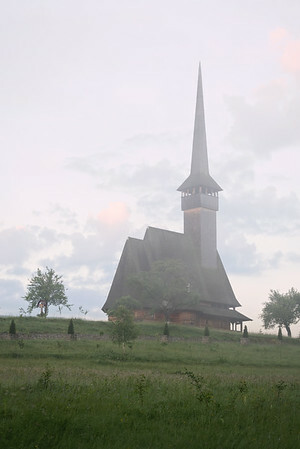 Monument in Romania on a foggy morning. 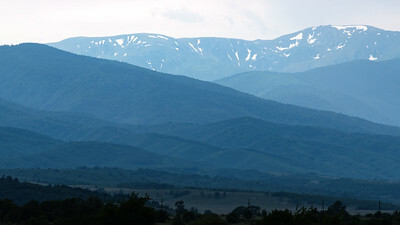 The beautiful clouds help to establish a lovely landscape shot. 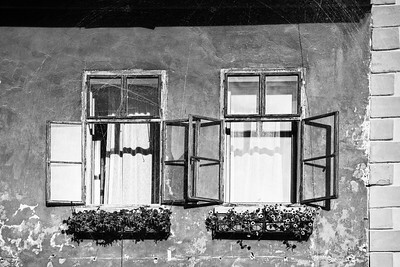 Black and White window sills of Sighisoara, Romania. 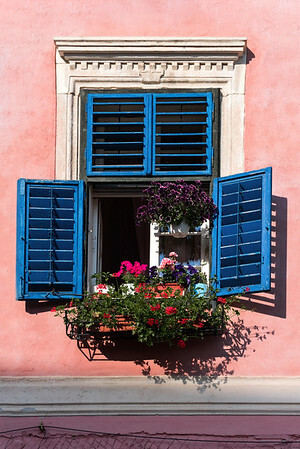 This was a lovely town with many rustic looking buildings and windows. 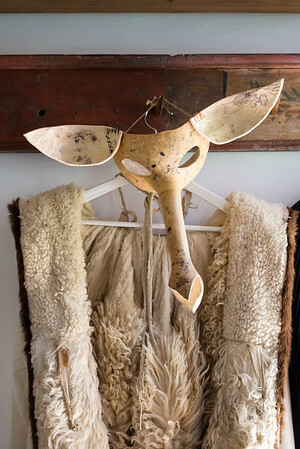 Loved seeing an capturing these images. 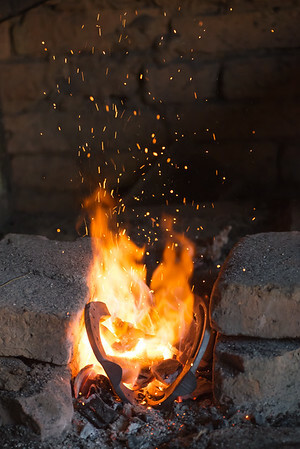 The stoked fires at a gypsy blacksmith forging horseshoes to put on the horse of a neighbor. 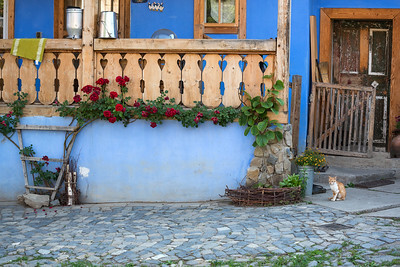 Romanian wildflowers. Everyone was looking at yet another church. 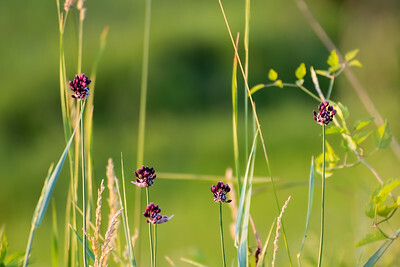 I turned around and caught the beautiful morning light hitting these purple wildflowers. 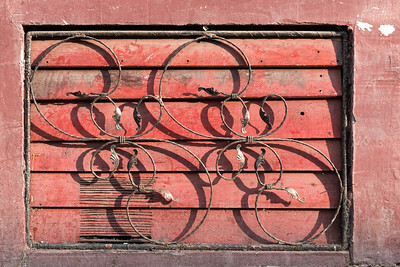 Sometimes, it is the little things that intrigue me the most.